Anaheim Ducks players celebrate a 5-4 overtime win against the Winnipeg Jets on March 31, 2014, in Anaheim, California. The NHL’s “loser point” is the stupidest rule in sports. For the non-puckheads among you, here’s how it works: The NHL awards one point in the standings to a team that loses a game in overtime or a shootout. But teams get two points for winning a game, whether in regulation or beyond. You don’t need a degree in #fancystats to recognize the problem: There are a total of three points to distribute when a game goes to overtime but just two otherwise. So it really pays off to play for OT. As FiveThirtyEight contributors Noah Davis and Michael Lopez documented Wednesday, this encourages dull, passive hockey. Goal scoring falls dramatically in the third period of tied games, right when a game should be coming to its climax. This is more than a minor annoyance; the loser point has already changed the identity of at least one NHL champion. In 2012, the Los Angeles Kings finished with 40 wins and 42 losses; they made the playoffs ahead of the 42-40 Dallas Stars because they accumulated 15 loser points to the Stars’ five. Then the Kings went on to win the Stanley Cup. Fortunately, having a rule as dumb as the loser point means that almost anything would be an improvement. For instance, the NHL could award three points for a win in regulation. An overtime or shootout winner would still get two points. That would at least make each game worth the same amount in the standings. Or you could eliminate the shootout and go back to having ties. The NHL claims that 70 percent to 80 percent of its fans like the shootout but has never made any detailed data on this available to the public. As regular readers of FiveThirtyEight will know, there are lots of ways to manipulate survey questions to produce a desired outcome. Maybe the same consultants telling Donald Trump that he’d make a great presidential candidate are advising Gary Bettman on the loser point. But I have something more radical in mind. Here’s the idea: You keep playing hockey until someone wins. You know, like in the NBA and Major League Baseball and pretty much every other sport but soccer — and like the NHL itself during the playoffs. The usual objection is that this could lead to some extraordinarily long games for two measly points in the standings. What if the Flyers and Penguins play a five-overtime game and the Penguins need to catch a flight to Calgary? Why add even more ice time to a grueling, 82-game regular season? But these cases are rarer than you might think. If you played every NHL regular-season game under playoff rules — 5-on-5 overtime, indefinitely, until someone scores — it would increase ice time by only about 3 percent. In the chart below, I’ve tracked what percentage of overtime playoff games (since 1995) were resolved within a given number of minutes. In the majority of games — 56 percent — someone scored within the first 10 minutes. Only 7 percent of games, meanwhile, required two or more overtimes. Overall, the average overtime game required 13.6 minutes before someone scored. Since 23 percent of playoff games went to OT, that makes the average length of a playoff game about 63 minutes, as compared to around 61 minutes during the regular season. That’s not much of an increase, and if the NHL were concerned about it, it could counteract it by reducing the regular season to 80 games from 82. Then you’d have no shootouts, no ties, no loser point and no overall increase in ice time. Still, maybe we’re concerned about those cases when one team has played a multiple-overtime game and faces off against another on fresh skates. Equivalent cases come up all the time in other sports — baseball, basketball, tennis — and they deal with it. But you could argue that it’s a bigger problem in hockey given the punishing nature of the sport. The solution is to take players off the ice, which will increase scoring. This isn’t a new idea at all — during the regular season, the NHL plays 4-on-4 hockey in overtime, and there have been proposals to go to 3-on-3. But here’s my insight: Goals are scored so quickly during 3-on-3 play that you could play every game to sudden death and pretty much never inconvenience anyone. The players, the referees, the 13-year-old in Winnipeg who refuses to do his algebra homework until the Jets game is finished — they’d all be OK.
You may have noticed, in the graphic above, that I drew a smooth curve (labeled “model”) alongside the historical data. 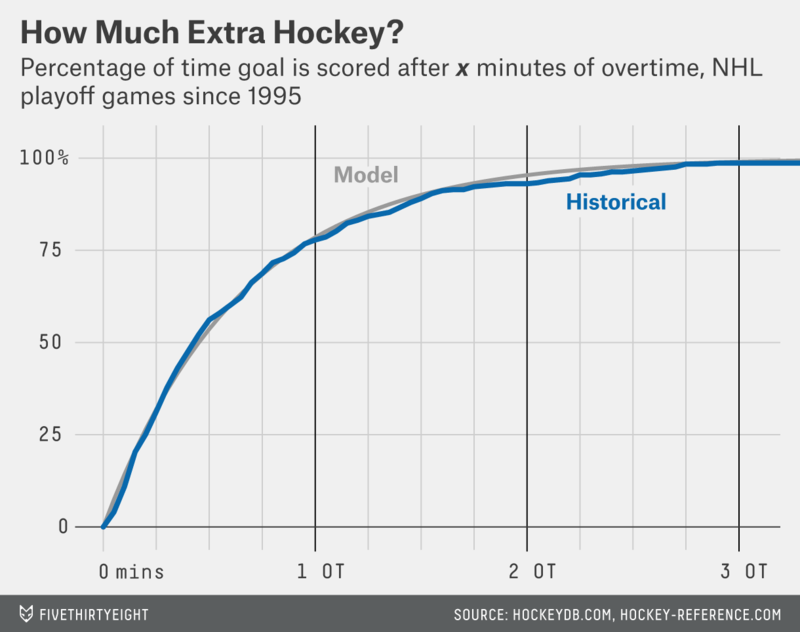 The curve is formed by assuming that there’s a 7.4 percent chance of scoring a goal per minute of overtime play, which is the historical rate in the playoffs since 1995. As you can see, the curve “fits” the historical data extremely well. That means the length of overtime games is easy to model.1 If you know the overall rate of scoring, you can accurately guess how many games will require at least two overtimes, for instance. In 4-on-4 play, there’s a 9.1 percent chance of a goal being scored each minute (according to research by Stephen Pettigrew), about 20 percent higher than under 5-on-5 conditions. It’s 3-on-3 action that sees a really radical shift, however, with a 16.8 percent chance of a goal each minute. So what if overtime was played 3-on-3? About 60 percent of games would be resolved within the first five minutes, and 84 percent within the first 10 minutes. Only about 3 percent of overtime games would require double overtime, and fewer than 1 in 1000 would go to triple-OT. The average overtime game would require just six minutes to complete, barely longer than under the current rules.2 And with just three skaters on the ice at a time, teams could give their bench plenty of rest between shifts. The NHL could also adopt some compromise or another. It could play five minutes of 4-on-4 overtime immediately at the end of regulation, as it does now, then clean the ice3 and play an indefinite amount of 3-on-3 overtime if needed. It could declare a tie if no one had scored after a full 20-minute period of 3-on-3 overtime. (Ties would be a rarity, almost like they are now in the NFL.) It could keep removing players from the ice until it was just goalie versus goalie.4 Would you not stop whatever you were doing to watch Henrik Lundqvist versus Tuukka Rask, one-on-one? Or insert your own proposal: Overtime decided by rock-paper-scissors? Nearly anything would be better than the loser point. 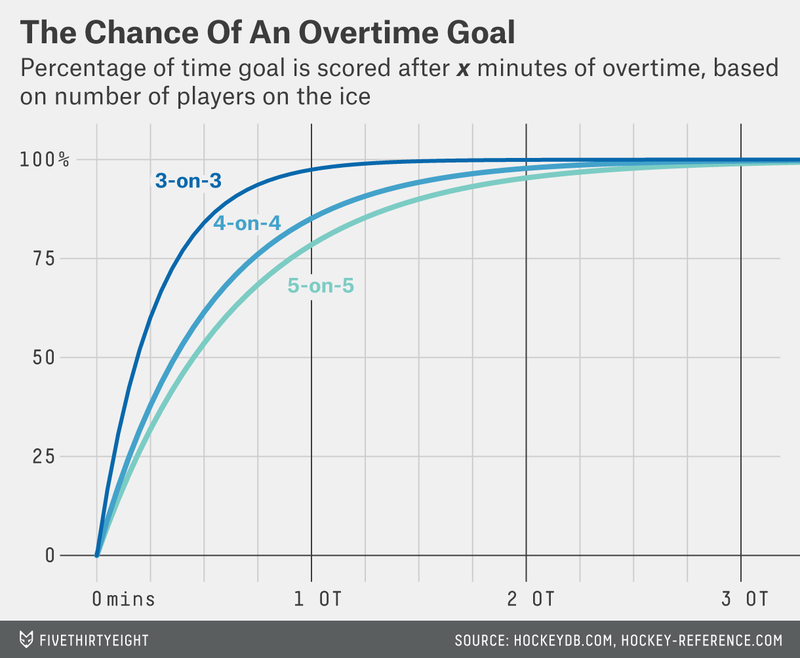 It also implies that the rate of scoring is fairly constant throughout overtime. And you’d reduce the number of overtime games since the loser point would be eliminated — teams would no longer have an incentive to play for OT. During the regular season, the NHL doesn’t bring the Zamboni out and clean the ice after regulation, something you’d probably need to do if you’re going to play more than a few minutes worth of extra hockey. As a fan, I don’t get why the NHL seems to be in a rush to finish overtime games during the regular season — I love the tension that builds up during the pre-overtime intermission in the playoffs. The NHL would need to relax the rule that prohibits goalies from advancing past the red line.